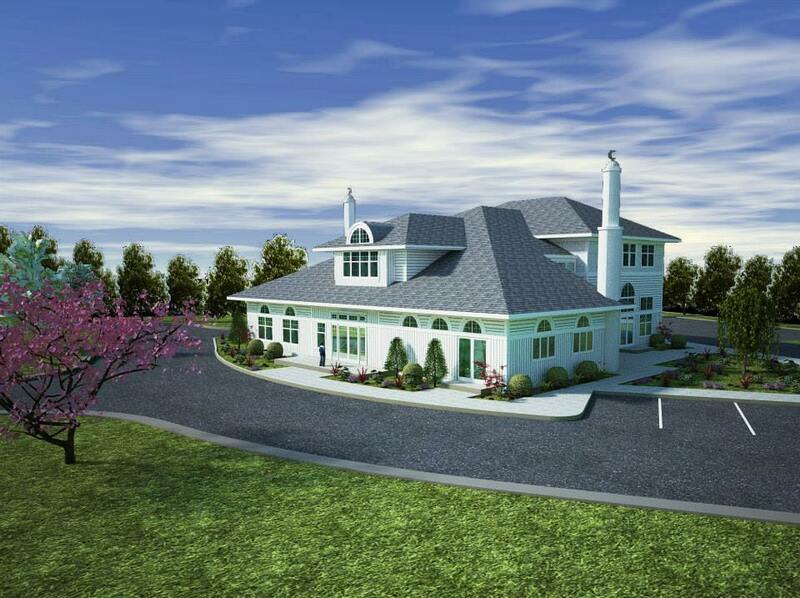 A model of the mosque in Bernards Township planned by the Islamic Society of Basking Ridge. NEWARK, N.J. (CN) – A New Jersey town took discriminatory action against an Islamic nonprofit that wanted to build a mosque on its own land, a federal judge ruled, handing down the decision on New Year’s Eve. Clocking in at 57 pages, the ruling against Bernards Township comes after more than five years of legal wrangling with the Islamic Society of Basking Ridge. In 2011, the year that the society bought property for its planned mosque, the township amended its zoning ordinances to say that houses of worship need a 3:1 ratio of parking spaces to seats, as well as primary access from a state or county road. The society, which had been meeting in a rented community center until 2010, bought its property on a 4-acre lot in a residential-zoning district of the township, nearby a fire station, church and elementary school. Its plan for the mosque included a prayer hall, kitchen and wudu room for the washing ritual, as well minarets resembling residential chimneys along the exterior. Islamic Society founder Mohammad Ali Chaudry said protesters began distributing anti-Muslim flyers the following year and denouncing the mosque in online posts. The group’s mailbox was also vandalized repeatedly – in one case its abbreviation ISBR was changed to ISIS, after the terrorist group. By 2015, the township’s planning board voted against the planned mosque, finding that its site plans had an unsafe traffic plan for children, a noncompliant storm water plan, and insufficient access for emergency vehicles. Attorneys for the township defended the analysis in court, arguing that different religions generate different traffic patterns, and that mosques shouldn’t be considered churches. The U.S. Department of Justice began an investigation soon after the Islamic Society filed suit in March 2016, joining in come November with federal discrimination charges. U.S. District Judge Michael Shipp awarded the society partial judgment on Saturday, finding the township had violated the Religious Land Use and Institutionalized Persons Act of 2000. The township “discriminatorily applied the parking ordinance on the basis of religion” and used a “discriminatory interpretation of the term ‘churches’ in the parking ordinance,” Shipp wrote. “Regardless of whether the intent focused on the denomination of the structure being built or the denomination of the congregation, the focus of the intent inquiry remains the disparate application of the parking ordinance based on religious affiliation,” Shipp added. Adeel Mangi, an attorney for the society, applauded the outcome in an email. “This is a landmark ruling interpreting the non-discrimination prong of the Religious Land Use and Institutionalized Persons Act that will have national impact in reaffirming that townships cannot treat applicants differently based on their religion,” said Mangi, an attorney with the Manhattan firm Patterson Belknap Webb & Tyler. Shipp said the ordinance provided the township zoning board with “unbridled and unconstitutional discretion,” as well as permitting “inconsistent methodologies” in applying the 3:1 ratio. Shipp cited three cases where non-Muslim houses of worship found swift approval by the township, even where they failed to meet the 3:1 ratio. The township approved a Jewish synagogue in 1995 within three weeks, and a Baptist church within two years. In a statement Sunday, the township said the court erred in disregarding a 2010 traffic engineering report that found additional parking was needed for the mosque. “This decision has major implications for municipal land use boards and their ability to determine the actual off-street parking needs of proposed projects without fear of alleged RLUIPA violations,” the Jan. 1 statement by Bernards says. Mayor Carol Bianchi did not immediately respond to an email seeking comment. Pauline Tutelo, who is listed as one of the attorneys representing the township, declined to comment on the ruling. “I don’t handle that aspect of the case,” said Tutelo, of the firm Marshall Dennehey. Bernards filed a request under the Freedom of Information Act in July, seeking all Justice Department documents related to the township, as well as those involving one of its attorneys, Chaudry, and representatives of Drew University’s Center for Religion, Culture, and Cultural Conflicts. The Justice Department has called the prior relationship between its attorney and Chaudry irrelevant to the lawsuits. A number of other religious groups, including Evangelical Christian and Jewish organizations, had filed amicus briefs in support of the Islamic Society. The Islamic Society was represented by Michael Buchanan of Patterson Belknap. The Manhattan attorney was not available for comment.